On Saturday May 15, WBA junior welterweight champion Amir Khan (22-1, 16 KO’s) defends his title against Paulie “The Magic Man” Malignaggi (27-3, 5 KO’s) at the Theater in Madison Square Garden. The bout will be shown LIVE on HBO’s Boxing After Dark at 9:45pm eastern standard time. Khan, 23, has won four in a row after being knocked out in the first round by Breidis Prescott in 2008. Since his loss to Prescott, Khan obtained victories over Oisin Fagan (TKO 2), Marco Antonio Barrera (TD 5), Andriy Kotelnik (UD 12) and Dmitriy Salita (KO 1). Khan also had a stellar amateur career, winning a Silver Medal at the 2004 Olympic Games. Nevertheless, Malignaggi’s career is blossoming now too. At 29-years-old, Malignaggi acquired new life with outstanding back-to-back performances against Juan Diaz. Although the judges scored the bout in favor of Diaz in the first fight, Malignaggi put on an exceptional boxing exhibition. Now, Malignaggi looks to become a two-time world champion. Previously, Malignaggi captured the IBF junior welterweight title when he conquered Lovemore N’Dou (W12) in 2007. However, it is not the chance at winning Khan’s WBA title that motivates the Brooklyn native right now. Malignaggi also feels his abilities are being underrated by Khan and his team. 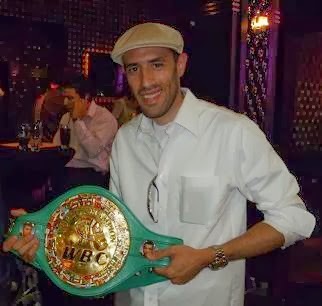 Malignaggi declared, “I’m excited about next Saturday. I had a really good camp. You hear Amir Khan this and Amir Khan that; He has a lot to prove. Amir Khan is going to be back in England sooner than you think. Malignaggi’s promoter, Lou Dibella, is in agreement with his fighter. On the other hand, Khan’s trainer, Freddie Roach, expressed great confidence about his fighter. “He’s on an upswing right now, but it’s about to end,” Roach claimed when asked about Malignaggi’s standing. “We have an advantage in every aspect of the game – speed, power and boxing ability. Everything he does well, we do it better. Khan concurs with his trainer. This fight will mark Amir Khan’s professional debut in the United States. Like “Prince” Naseem Hamed, who fought Kevin Kelly in 1997 at Madison Square Garden, Khan is hoping to make a similar statement in his arrival. “A lot of fighters leave the U.K. to fight fighters in the U.S. later in their careers,” said Khan. “Golden Boy Promotions made me hungrier to fight over here. I think Madison Square Garden is the Mecca of boxing. There have been huge fights there; Ali fought over there, Tyson and big, big names. Hopefully, you could put my name down there. Before Khan can fight in the United States, however, he needs to obtain a work visa. Khan originally opened camp at the Wild Card Gym in Los Angeles, California. Currently, Khan is training in Vancouver, Canada. David Itskowitch, Chief Operating Officer of Golden Boy Promotions, addressed the issue this afternoon. “The visa status that he came on is the Visa Waiver Program, which is something that is available to citizens in about 30 countries, mostly European countries,” clarified Itskowitch. “It allows someone that is on a plane to fill out a form and hand it in when they get to immigration. From there, they’re given a tourist visa that is good for x amount of days. “His status in this country was as a tourist. In order to change your status from that status to someone who can work, you have to leave the country, get a visa and come back in. Vancouver is the closest consulate where an appointment to do this could be gotten. Lou Dibella believes the issue will be resolved.